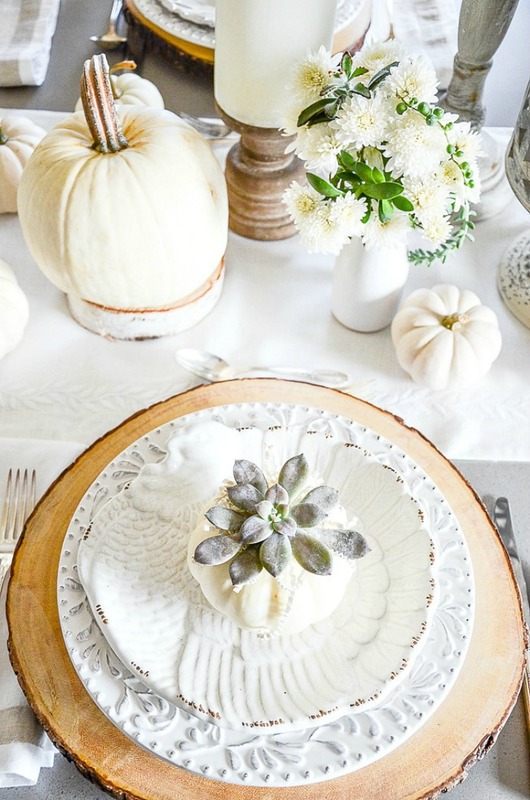 Today on Decorating Tips And Tricks we are talking about FALL CENTERPIECES. Oh, we have so many great ideas for you! And make sure you read the show notes at decoratingtipsandtricks.com to see all the links to what we are talking about. It’s HOME STYLE SATURDAY! Thanks, Lory for putting this group together. Please check out her gorgeous blog Designthusiam. Check out the beautiful posts at the bottom of this post. Now for the rest of the pumpkin ideas! 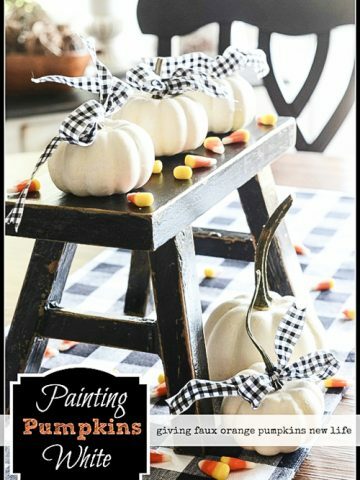 use caulk to create designs on a faux pumpkin and then paint over it- so pretty! 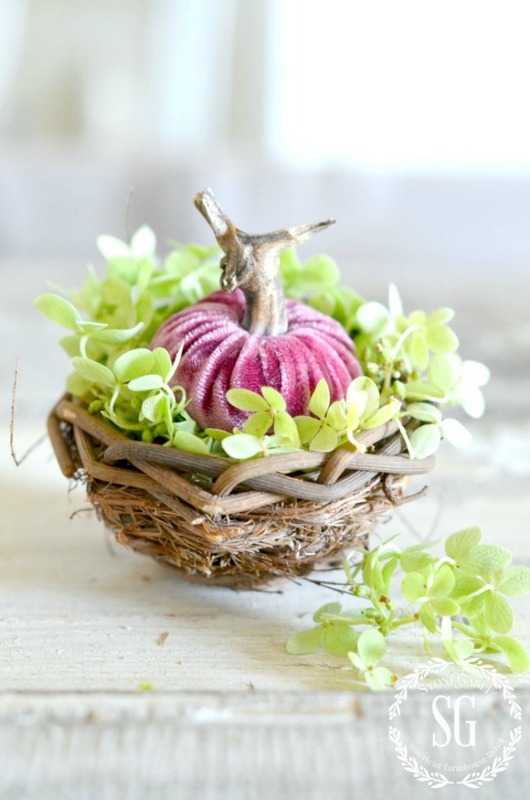 pop off the top of a faux pumpkin and add a small decorative knob- see a tutorial HERE. decorate pumpkins with stickers like spiders, dots, bats, etc. Phew!!!!! 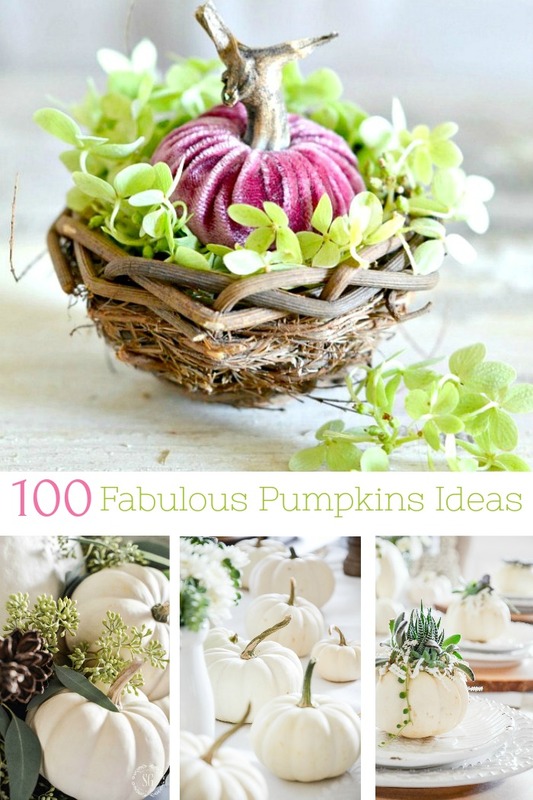 100 Fabulous Pumpkin Ideas!!!!! 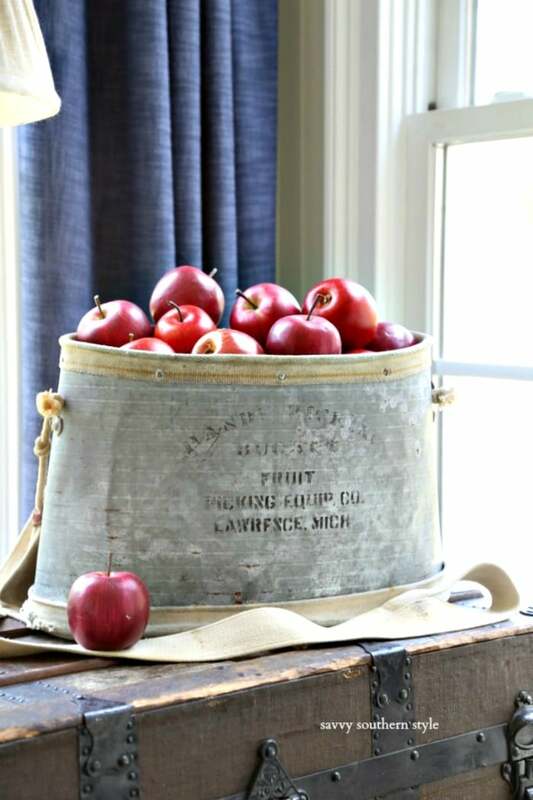 I hope you will be using some to decorate your home this fall! This week is a wonderful FALL IDEA TOUR! 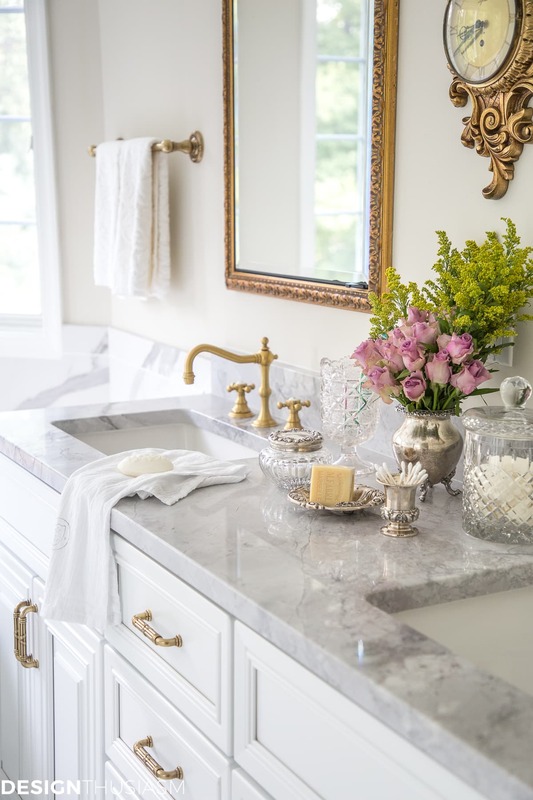 You will love these beautiful blogs… Check them out! So many cute and classy ideas! 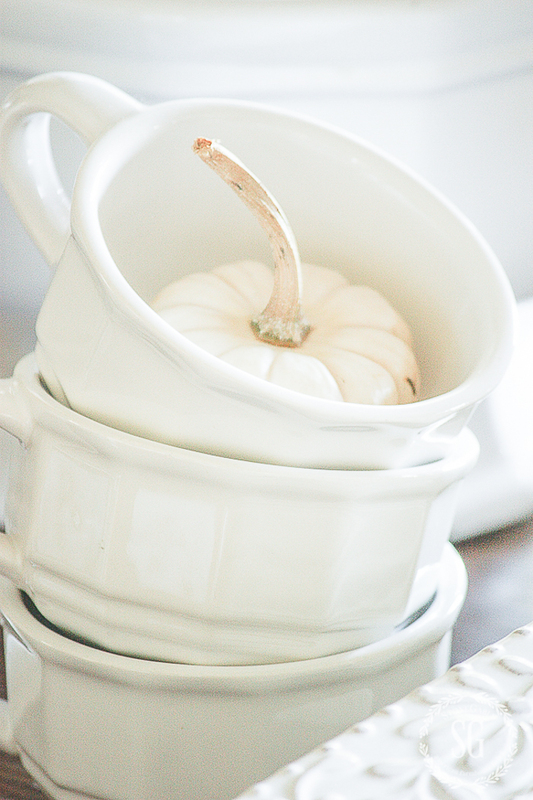 I washed my pumpkins, as suggested by one of the bloggers in your group, and I really think they are lasting longer. I pulled one out yesterday and cut it open to put my dip in for a chip & dip tray! !I have enjoyed your pumpkin posts so much that I will be sad to see the season change. However, I am sure you will keep us entertained with festive ideas!! 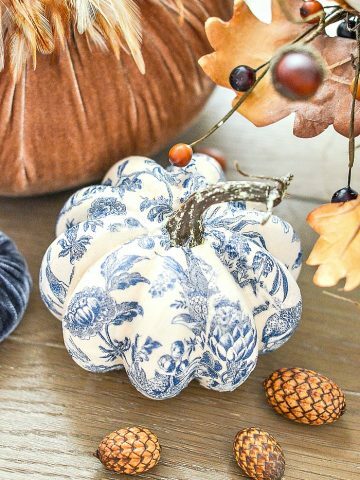 I love the pumpkins, particularly the ones covered in blue and white napkins. Where can I purchase the napkins? Help!! 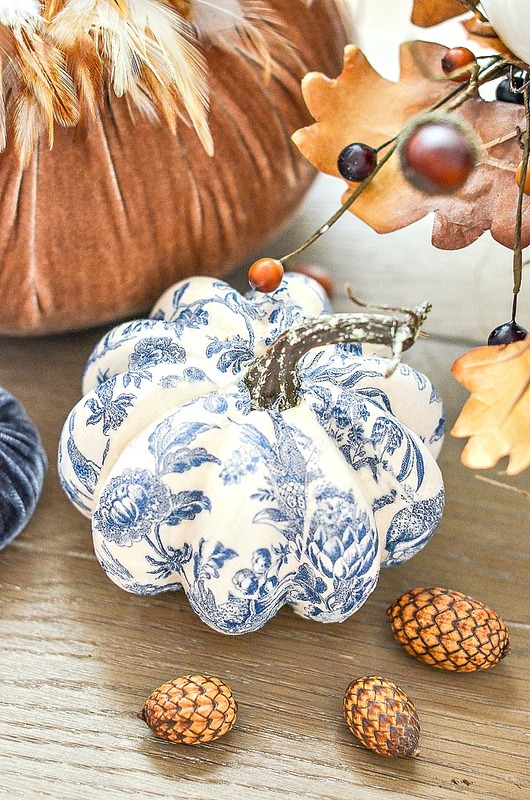 Go here: https://www.stonegableblog.com/chinoiserie-pumpkin-diy/ and the info is in the post. Hope this helps. So many wonderful ideas. Now the job is to see which ones to use. Thank you so much. So many ways I have never thought of. 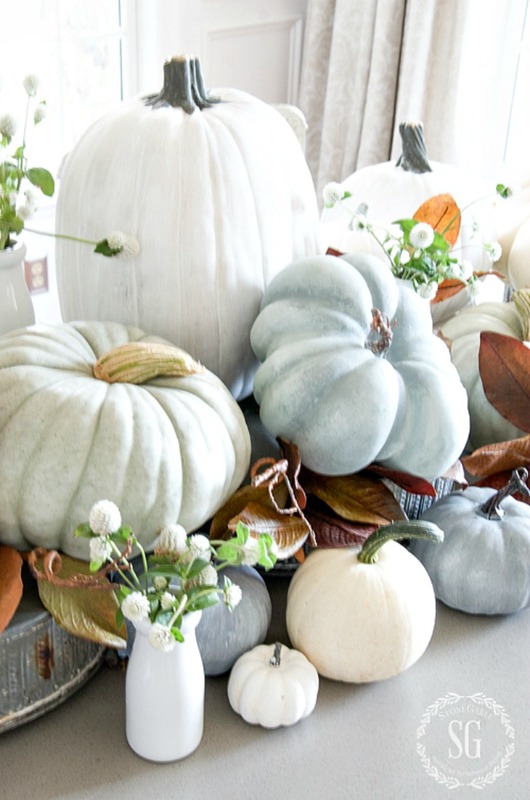 Love all the different ways you decorated with the pumpkins. I have one more for your list. Buy a package of little plastic mice. Cut little round holes all over the pumpkin. Insert a mouse in each hole. Have some mice peeking out of the holes and some with their tails sticking out. A mouse hotel! It’s not glamorous but very cute. I got the idea from Martha Stewart years ago and had fun doing it with my grandchildren. They loved it! 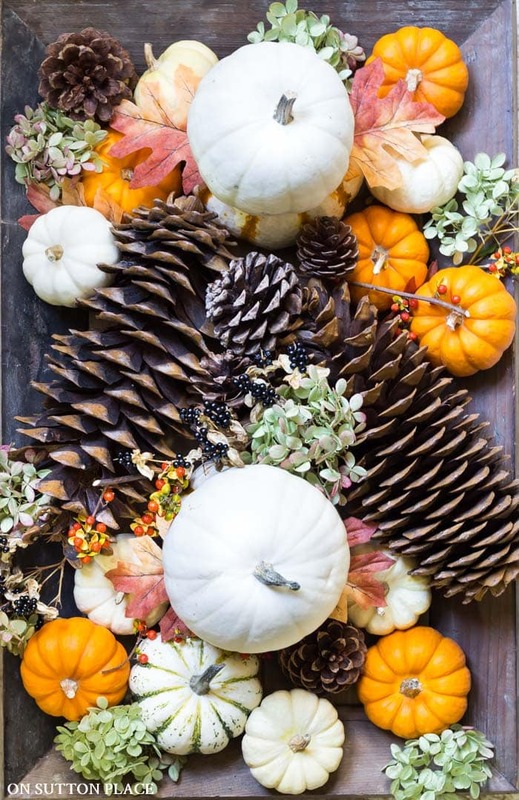 Happy Saturday and Happy Fall Yvonne….hope you are well and enjoying your Fall in that great state of yours!….Have always adored your pumpkin decor!….Have a fabulous weekend!!! Hello sweet friend! Happy Fall to you! I’m always reading great ideas in your posts. I hadn’t thought of doing several of these easy to do decorating ideas. I like the idea of lining my windowsill with pumpkins. I liked the idea of putting fruit kabobs into a pumpkin as a serving display idea. My favorite idea is the spray paint in water! Happy Saturday! I think I love pumpkins almost as much as you…and I love mums!! I can’t wait to use some of these tips!! 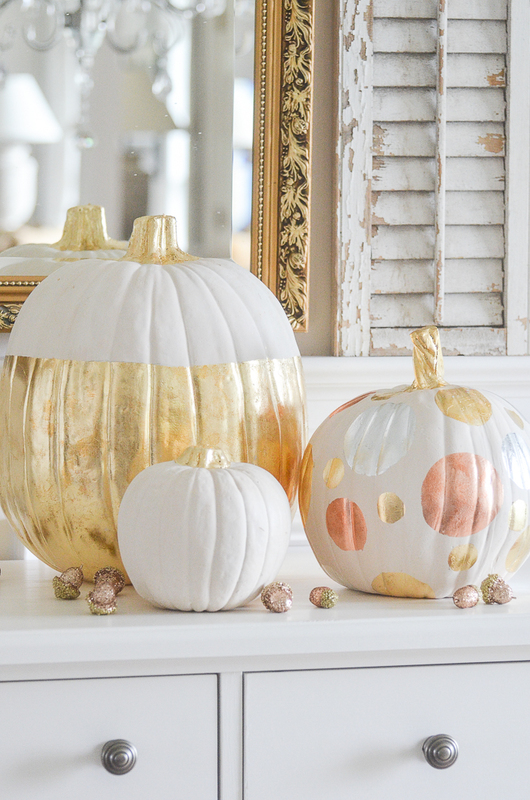 Soooo many wonderful ideas for pumpkins! Thanks for your ideas! Loved your video ! I’m getting into the Fall mood. On Halloween I celebrate 3/4 of a century on this wonderful planet Earth. My decorating is going to be over the top , and you’re the first one I come to for ideas. Love your blog today Yvonne. Fall is so beautiful and all the vibrant colors. I will be dreaming about pumpkins tonight-ha-ha!!! 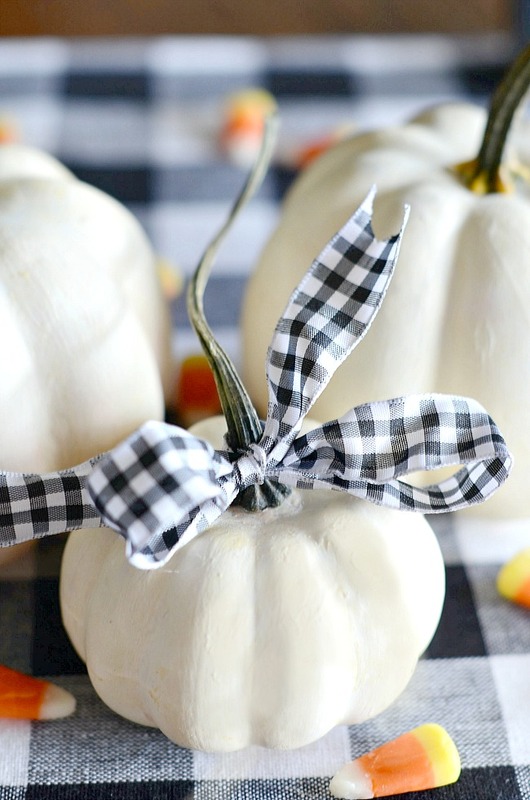 What wonderful simplistic pumpkin ideas! Awesome! I’ve been inspired! Yvonne! You are making everything SO difficult for me! 🙂 All of your inspiring ideas for fabulous pumpkins have left me with so many choices, I’m having a time deciding which one(s) I want to do! I keep changing my mind. Your posts could not have come at a better time. Since the beginning of the summer, I’ve been in a creative funk…so dry. I tried several things over the summer to “jumpstart” myself and…nothing. I just recently started following your blog and what a difference you have made! I’ve been reading all of your posts and studying all of of your Pinterest boards and slowly but surely, I’m feeling my creative side coming back to life. I have started an inspiration board in my office with ideas I’ve gotten from you, thank you for sharing your marvelous mind! These are all great ideas! Thanks for putting them together for us. 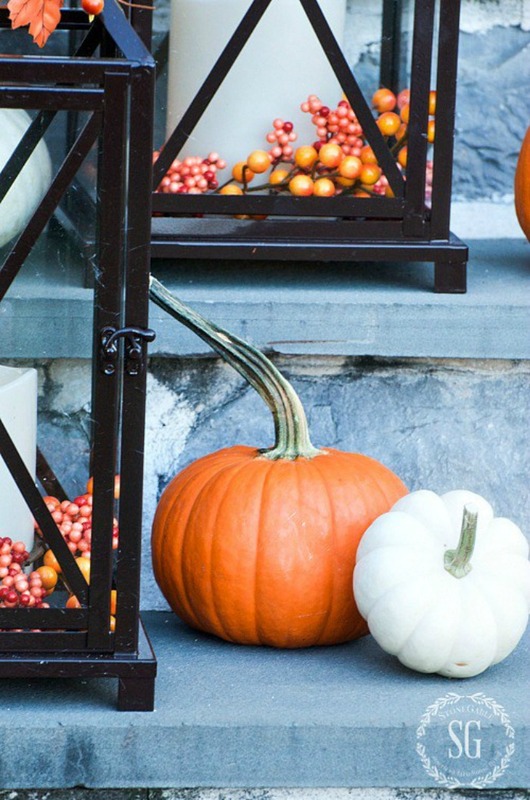 I definitely have the two blogs pinned to my Fall Pintrest board. WOW! 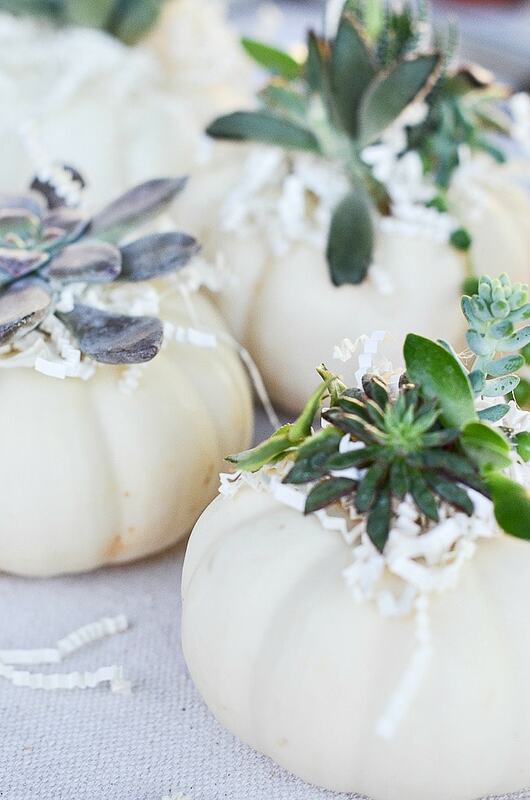 Those pumpkin ideas are gorgeous. Thank you for sharing. I love your pumpkin ideas. Thank you for the pumpkin ideas. Pumpkins!! Those are all great ideas. I can’t wait until pumpkins show up around here. It’s always fun to decorate with them. Thanks for all the ideas! Wow! That’s a lot of ideas to get the creative juices flowing! Thank you! Love these ideas. 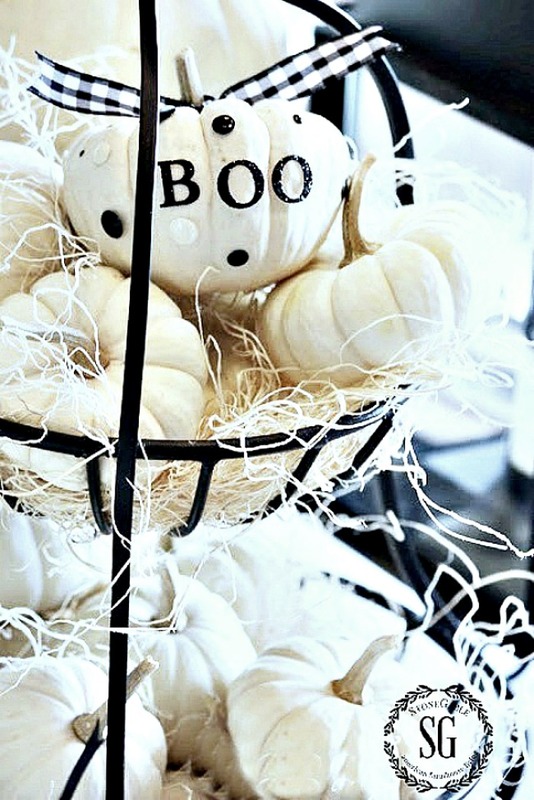 Love everything pumpkins. 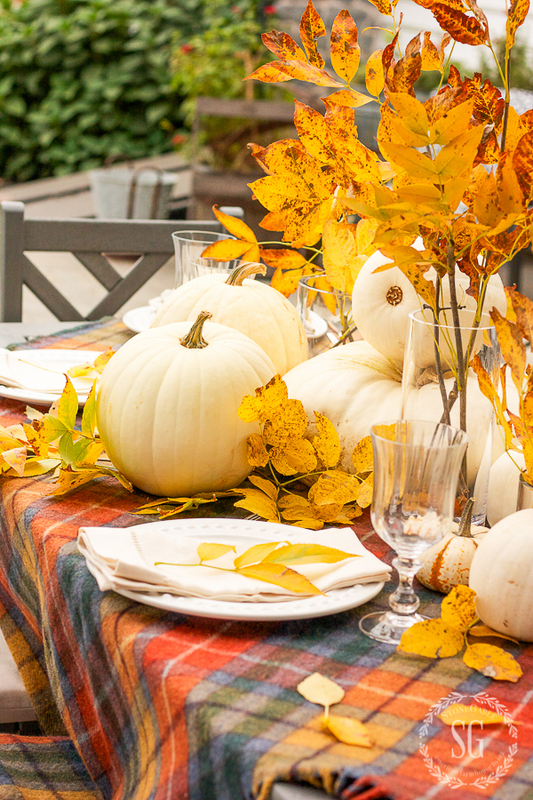 You always do a fantastic job of decorating your home for Fall. I look so forward to seeing everything you do. Yvonne, I just wanted to take a minute to thank you for all the hard work you put into your blog! It has come such a long way since you first started and you have done an absolutely amazing job! I truly admire everything about you. Just wanted to tell you how much I appreciate reading them, they are always inspiring! I also opened my Autumn Cottage Journal last month and first thing I saw was your house! I shouted out to my husband, “My friend Yvonne has her home in Cottage Journal!” He said, “Do I know her?” “Well, she is my blog friend,” I said. He looked confused. LOL! So happy for you! OF COURSE WE ARE FRIENDS, JODY! We have just never met! Thank you for your very sweet and encouraging words. Yvonne. Your “pumpkin” ideas are so inspiring. I love everything you do! Thank you for sharing so many wonderful pumpkin ideas! I can’t wait for fall! I love these ideas. I also love pumpkins!!! 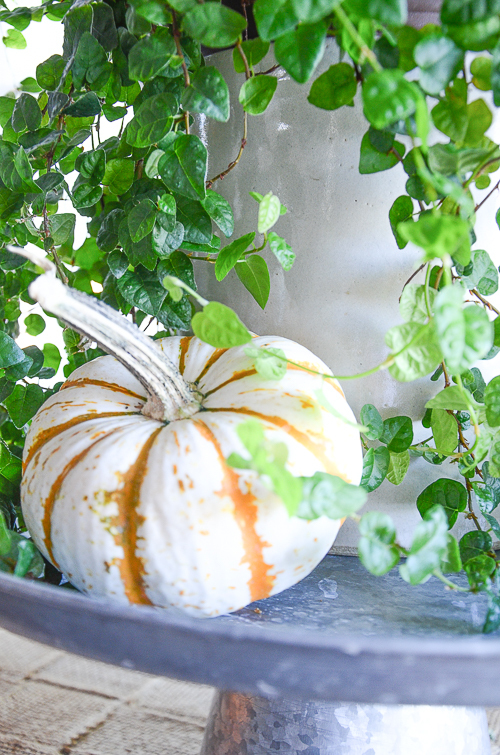 This year I have been focused on pumpkins and stepping out of my traditional comfort zone. I love your ideas of the blue and neutral colored pumpkins. I love fall and your ideas have my creativity kicking it up a notch. Thank you!!! Great! I want everyone to kick up their creativity a notch! Thank you so much for all your great ideas..and I do use many of them. It’s still hot in Texas, but next week when home from vacation decorating begins!! Doreen – We are also awaiting Irma. Stay safe! Stay safe and do what the authorities say, Doreen and Carol. I am praying for everyone in Irma’s path. Oh Yvonne, I am so with you on the Pumpkin Love! My husband & kids think I’m obsessed…and I am! How can you not love these beautiful fruits of the bounty at Harvest time? Love all of your ideas, thank you so much for sharing!! Thanks for all of the great ideas! It’s time to gather the pumpkins! Wow, so many great ideas!! Thanks!